This plugin introduces the concept of Instance Items to manage your items and equips. For example, let’s say you purchased two short swords. Actor 1 then decides that he wants to “upgrade” the sword he holds to improve its strength. The blacksmith proceeds to temper his sword, changing it from “Short Sword” to “Short Sword +1” to indicate that it has been upgraded once. By default, when you receive an item, you don’t receive a physical copy of the item. Instead, you receive the right to use an item. This means that if you purchased two short swords, it simply means two people can use the same sword. When one person decides to modify the sword, anyone that’s using the sword will notice the same changes. An “instance” of an item is a physical copy of the item. All items that you set up in the database are called “templates”, or “blueprints”. Instances are created by using templates to determine properties such as its name, its parameters, and so on. An instance is an individual object that has nothing to do with any other instance of the same template. For example, if actor 1 proceeds to upgrade his copy of the sword, the other copy will remain untouched. 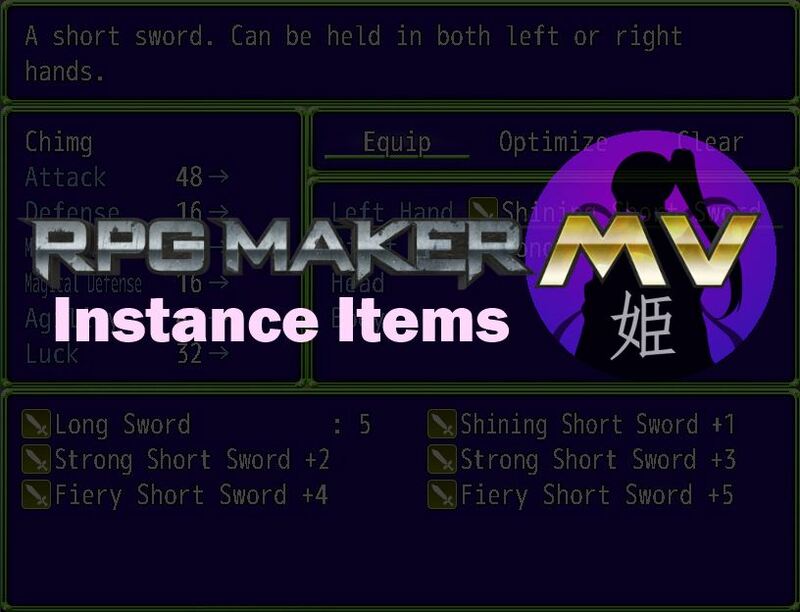 By introducing instance items to your game, you can begin to add new mechanics such as item levels, item affixes, item durability, and other mechanics that rely on each item to be an individual instance. This plugin is currently in closed-beta testing. Closed beta testing is available to Tier 2 patrons on HimeWorks Patreon. If you are already a patron, gain access to the link by clicking here. Download ths plugin and place it in the “plugins” folder in your project’s “js” folder. Then open your Plugin Manager (F10), double-click an empty row, and select the HIME_InstanceItems plugin. If you are using Equip Slots Core, place Instance Items below it. Instances can be used for Items, Weapons, or Armors. Instances that are created during the game will be added to the database. For example, if you have 20 weapons in your database, the first 20 weapons will be your templates. The first instance will be created as weapon 21, and all other instances will be added in the order that they are created. It is important that you RESERVE space for your templates if you plan to introduce new templates later. 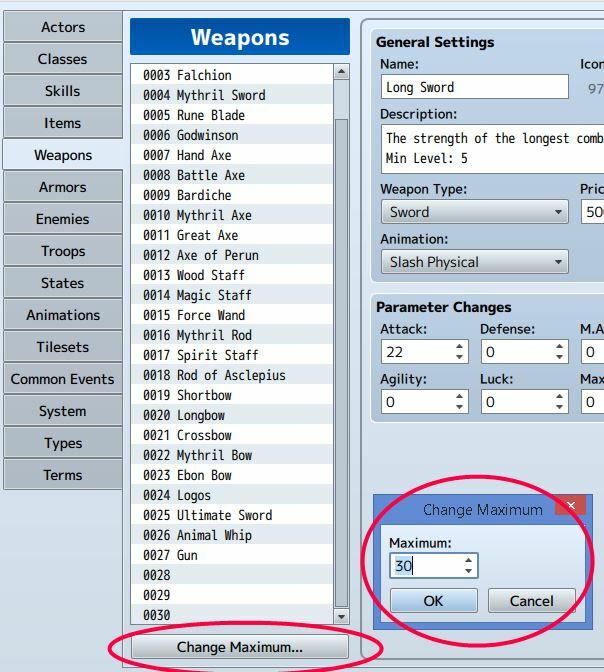 For example, if you start with 20 weapons, but think it can go up to 100 in future DLC’s, you should set the maximum to 100. There is no harm in reserving lots of database space, so you can give yourself 1000 if you feel that you may need 1000 templates in the future. In the plugin parameters, indicate whether all items will use instances by default or not. This applies to all usable items, weapons, and armors. Where true means it will use instances, while false means it will not. You can have a mix of instance items and non-instance items in your game at anytime. Is there any chance of this being released to the public. I would really like to at least see how the mod works.